First day open. What would happen?Who might come? 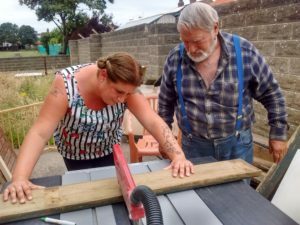 First day and two new Shedders arrived to add to the Three Musketeers Brian, Ted and Graham (we must get here – a joke – well, don’t laugh then). We had Alan and Tom. Alan’s was metal turner, welder and bike shop proprietor in former times (he knows Ted from motorcycle trials) and Tom a joiner. Into the mix also came two familiar faces Linda and Karen. We had Malcolm Jackson (the vicar of these parts! popping in, a visit from Lindsay Morgan of Carers’ Resource with some thoughts and Shedder Roger.from Whitby to nose around! 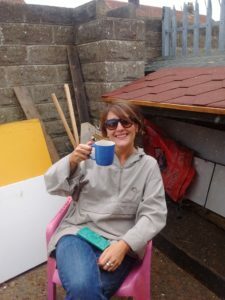 Plus Kate Gordon from Warwickshire who came to learn more about Sheds and their flavours. 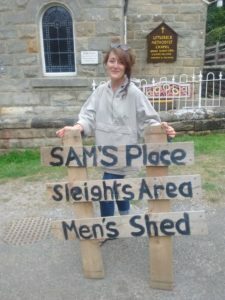 She visited SAMS in Littlebeck too. We’ll share some news of Kate soon and more behind her coming! 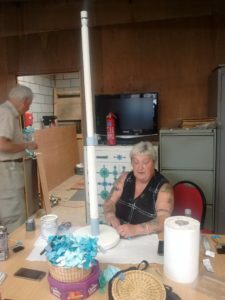 Shedder Linda from Staithes upcycles a standard lamp. Stages 1 & 2 were sanding and painting. Kate leaves her mark on Littlebeck. She Shed Whitby and Reminder about Staithes Shed!